One nice feature of FireFox is the built in search bar. It is customizeable, you can write search plugins for every site imagineable. 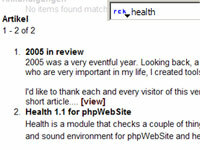 You are on a phpWebSite support site now, so chances are you'd like to search on it as well. The good news is, that I've already done the work for you. All you need is to download and install it. Then, find the directory “searchplugins” of your FireFox installation. My search plugins are located in C:\Programme\Mozilla Firefox\searchplugins. Unpack all the files to that directory. After you've done all that, close every single window of FireFox. Even the download or extension windows. And start it. Pressing on the search drop-down list should now show you the search plugins you've just installed. Use the search plugins like every other search plugin. Select it from the drop down list, if you haven't already. And enter your search term in the search bar. After pressing enter, you should see the search results for that term in your current FireFox tab.